Magento 2 Advance Booking Notification: Using this extension, the admin can send SMS notifications in advance to the customers for the booking notifications. The notifications can be sent out to multiple customers at a time as well. 1. This extension is an add-on to the Magento 2 Advanced Booking and Reservation extension. So, to use this extension you must have first installed the Magento 2 Advanced Booking and Reservation extension. 2. Booking types supported – Default, Appointment, Event, Rental, Hotel, and Table. SMS Notification on booking confirmation. SMS Notification on booking cancellation. Unzip the respective extension zip and and then move “app” folder (inside “src” folder) into magento root directory on the server. Now, run the below-mentioned commands in the Magento 2 root directory via terminal. lastly, flush the cache and re-index all by navigating through System->Cache management. For translating the module language, please go to app>code>Webkul>AdvanceBookingNotifications>i18n and edit the en_US.csv file. Now, translate the words on the right and upload the modified file to the same location. The filename of the translated file should be according to the language and region code like de_DE.csv. 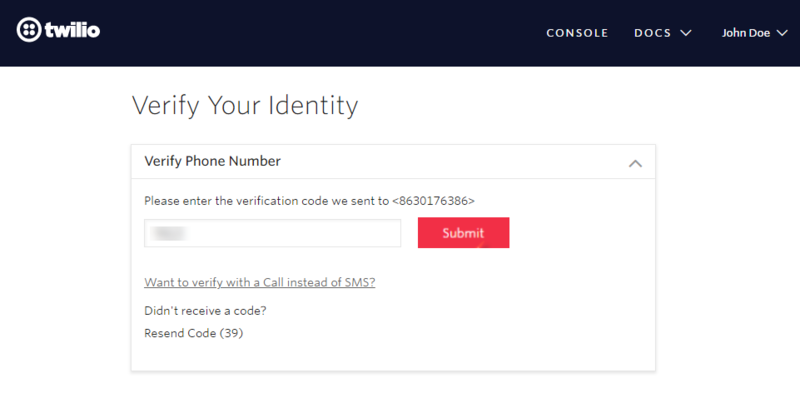 How to Get Twilio Credentials? Step 2: Now after clicking on the SIGN-UP button, below page will be open. Here, the admin will enter all details to get registered and will tap the Get Started button to proceed further. Step 3: Now, enter your mobile phone number and tap the Verify button to verify the number. Step 4: Now, you will receive a verification code on your mobile phone. Enter that verification code and tap the Submit button. Step 5: Now, the page that comes up, on the top right-hand next to your name tap the down arrow and then click the User Settings menu option. Step 6: Now go to the Dashboard menu option in the left panel. Here, you will find the Account SID, Auth Token. 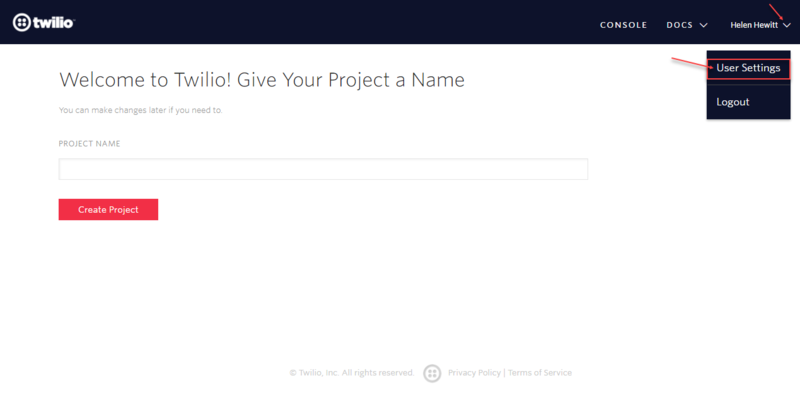 Step 7: To get the Twilio phone number, go to the dashboard again and tap the Phone Numbers link. Step 8: Clicking the phone numbers link will bring up the below page. Here, click on the Get Started button. Step 9: The section that comes up, click the Get your first Twilio phone number button. Step 10: Clicking the Get your first Twilio phone number in the previous step brings up a pop-up window. Click Choose this Number button to proceed further. Step 11: Now, you can see your new phone number, click done to go back. Step 12: Now, to check your phone number click the Phone Numbers link under the dashboard section as shown in step 7 and you will be redirected to your phone number section. After the successful installation, to configure the module settings navigate through Stores->Configuration->Webkul->Notifications Setting. Here, we have three sections for the configuration of various settings of the extension. 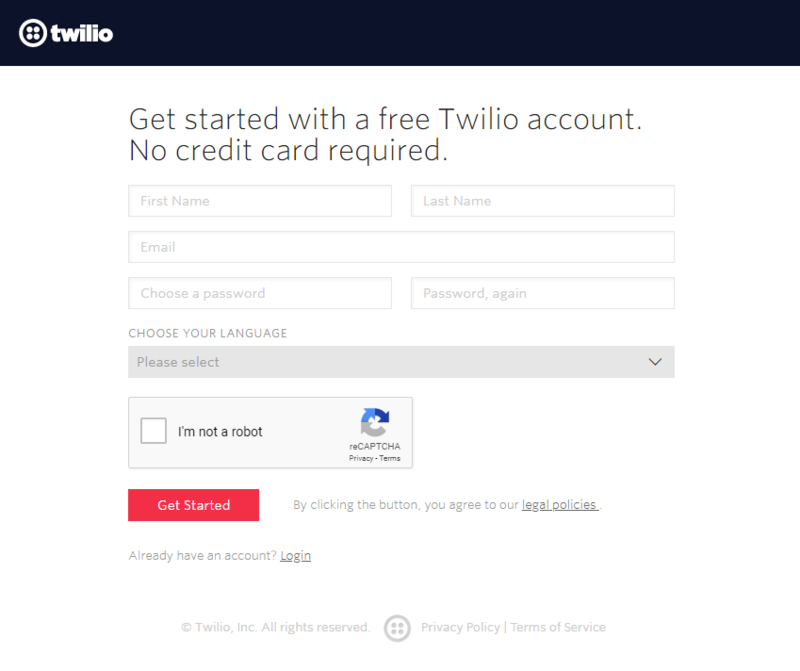 Auth ID: Enter the Auth ID that the admin received after registering at Twilio. Token: Enter the Token that the admin received after registering at Twilio. Sender Mobile: Enter the mobile number that the admin received after registering at Twilio. Booking Reminder (Days Before): Set the days for the booking reminder message to be sent to the customers prior to the actual booking date. Booking Reminder (Minutes Before): Set the minutes for the booking reminder message to be sent to the customers prior to the actual booking time. Message(Minutes Before): Configure the the message for minutes before event reminder that will be sent to the customers prior to the actual date of booking. Message(Days Before): Configure the message to be sent to the customers for the days before event reminder. Message(Invoice Create): Configure the message to be sent to the customers when the invoice gets created. Message(Invoice Cancel): Configure the message to be sent to the customers when the invoice gets cancelled. Message: This message will be sent to the customer if message field is left empty while sending custom messages from ‘View Bookings‘ grid. After making all the settings, tap the Save Config button at the top right-hand corner. When the admin generates the invoice from the backend, the Invoice Generated notification will be sent to the customer as shown below. When the admin cancels the booking from the backend, the Booking Cancellation notification will be sent to the customer as per the below image. Booking alert messages will be sent to the customers on configured date and time. And, this configured date and time should be prior to the actual booking date and time. These messages will remind the customers about their booking date and time. Note: A cron is set for this module. So, the alert messages will be sent to the customers automatically. The admin will be able to send custom messages to the customers. To do so, the admin will navigate to the View Booking Orders section. To send the message notifications manually, the admin will first select the booking Ids for which he wants to manually send the notifications. Then from the Actions drop-down option select Send Notification option to send in the notification manually to the customers. After clicking the Send Notification button, a pop-up will appear. here, the admin can enter the custom message and tap the Continue button to send the message. After this, the admin will see a success message as shown below in the snapshot. After this the customer receives message as shown below in the snapshot.